You are here: Home / News Features / NYC Event Guide: Celebrate St Patrick’s Day in New York City! NYC Event Guide: Celebrate St Patrick’s Day in New York City! Top of the mornin’ to you! Feeling spontaneous? Why not celebrate St Paddy’s Day in #NewYorkCity next March! Luckily this St Patrick’s Day falls on a Sunday so there’s no reason not to enjoy a full day of celebrations! And to ensure you don’t miss out on all the fun, we’ve put together some last minute St Patrick’s Day packages just for you (details below)! So don your best and greenest gear and pin on those shamrocks, here are the best Irish events to look forward to in New York this St Patrick’s Day! Running for more than 250 years, the New York St. Patrick’s Day Parade is the oldest St Patrick’s Day parade in the world – and one of New York’s most anticipated March events. 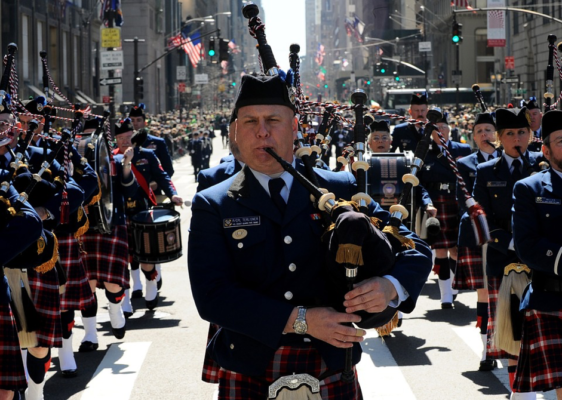 An estimated two million people join to witness the six hour parade that marches up Fifth Avenue and past most of New York’s iconic landmarks, such as St. Patrick’s Cathedral and Central Park. This festive parade ends at around 5pm at the American Irish Historical Society. To avoid the crowds, stand anywhere north of 66th Street and Fifth Avenue where you will get a good view of the parade without the crowds. If you’re in the mood for a spontaneous St Patrick’s Day celebration, why not join the annual St Patrick’s Day Pub Crawl? This two day party is the biggest daytime event that takes place in the heart of New York City and features drinks specials at hundreds of participating bars in many of NYC’s neighbourhoods, including East Village, Murray Hill, Chelsea, Midtown West and more. Tickets include a green wrist band and a drink map of participating bars. Dressing up in green festive gear is encouraged! Join a back-stairs behind the scenes tour and experience the Merchant’s House through the eyes of the Irish servants who once worked here. This tribute to the Tredwell’s Irish Servants with Bridget Murphy offers an inside look into the lives of the Irish immigrants who worked here during the mid-19th century. Climb the narrow stairs to the servant’s quarters on the fourth floor, learn about some of the strange happenings and face the ghosts of family members who passed away in the house on this haunted house tour. Celebrate the festive cheer of St Patrick’s Day without the booze with the sixth annual Sober St Patrick’s Day party at the youth centre. This festive event will feature Irish dancing, traditional Irish music and plenty of food and refreshments. The ticket includes snacks, baked foods, tea/coffee and soft drinks and additional food will be available for purchase. Watch Leprechaun in the Hood at midnight at the Nitehawk Cinema on St Paddy’s Day. A full menu offers everything from burgers to cocktails and beer so you won’t have to miss out on the brew! Unwind from the St Paddy’s Day celebrations with coffee and a late buffet breakfast at the Union Arts Center. Scones, hash and traditional Irish music will be enjoyed alongside beer, wine and mimosas. Particularly popular with UK visitors, Irish Fest at Webster Hall has something for everyone. With live Irish Music, a bagpipe troupe alongside Irish food & brews and for just $10.00, what more could you ask for?! Wind down St Paddy’s Day with a St Paddy’s themed walking tour in Lower Manhattan. The tour travels through New York’s former “Little Ireland” district to learn about the Irish immigrants who lived and worked here. Stops include Al Smith’s home, the Five Points and the first Catholic church in the city. Join the Brooklyn Street St Paddy’s Day Parade that honours the 44th anniversary of the Battle of Brooklyn and the Irish-American contributions to New York City. Make sure you arrive a bit early as there will be a time to commemorate the victims of 9/11 at 12h45.